June 7, 2017 - Like us now! 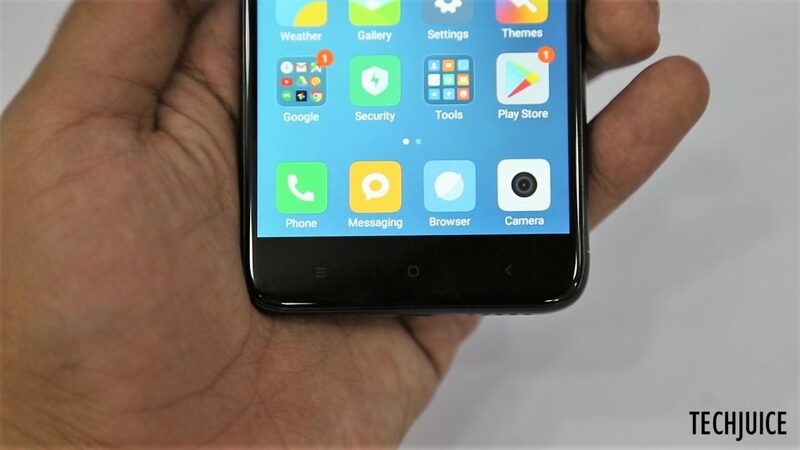 Thanks to the influx of Chinese smartphones in the market, people’s expectations for budget smartphones have skyrocketed in the past few years. Gone are the days when a couple of manufacturers exercised their monopoly by depriving the lower end of the market of decent specs and feature set. Due to the increased competition in this space, we are witnessing remarkably better phones at a very low price point. Xiaomi’s Redmi 4X aims to continue this upward spiral of budget smartphones with some pretty interesting set of specifications and features. It is currently on sale at mistore.pk for a price of PKR 18,900. 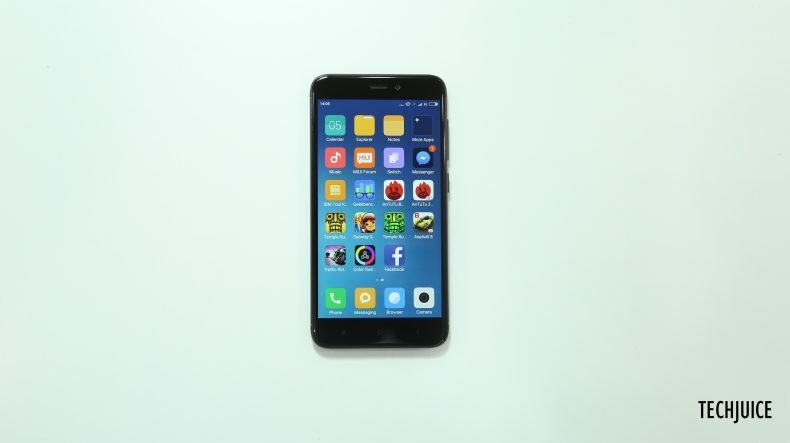 It is being distributed by Smartlink Technologies, which is Xiaomi’s official distribution partner for Pakistan. Along with Redmi 4X, Smartlink is also aiming to bring all the other Mi products to Pakistan in the coming months. Let’s look at what the phone has to offer to better gauge if it is indeed worth your hard earned money. Before going into further details about Redmi 4X, let’s first get the pros and cons of this device out of the way. 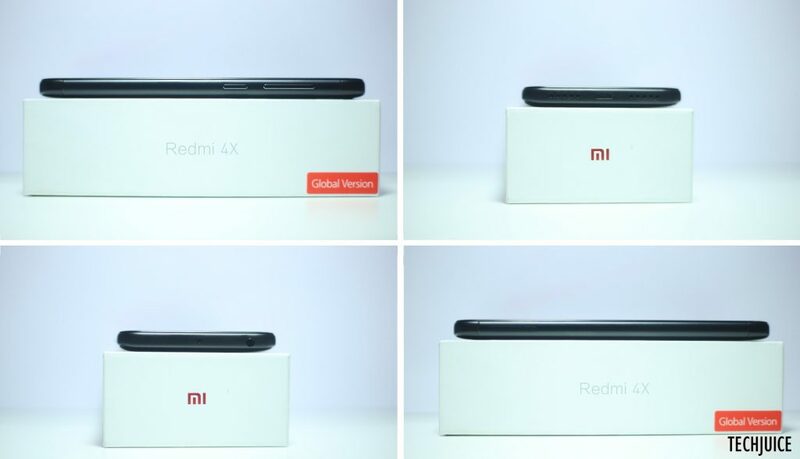 Just as Marian Wright once said, “In every seed of good there is always a piece of bad”, there are also some cons which come along with Xiaomi Redmi 4X. 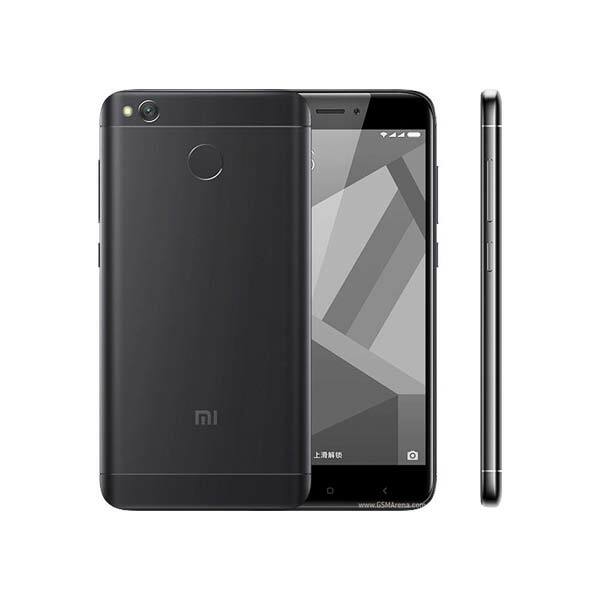 Considering a sub 20K Pakistani Rupees price, most people would probably not expect anything spectacular in the design and build quality of Xiaomi Redmi 4X. This is not the case with Xiaomi Redmi 4X. It has a good design and premium look, its build quality is comparable to the devices present in a much higher price bracket. With its rounded edges and light weight, the device feels very comfortable in hand. Due to its 5 inch screen, Redmi 4X fits snugly in the palm and is perfectly suitable for one handed use. The front of the device houses the three capacitive buttons which help navigating through the user interface. Unfortunately, the buttons are not backlit, which might pose some problems for first time users. Thankfully, other buttons like the power button and the volume rockers are tactile and easily clickable while operating the device. Xiaomi Redmi 4X supports a 5 inches 720p display which is hardened with Gorilla Glass protection against accidental bumps and scratches. Although the 720p screen might seem a bit low in this era of FullHD and QuadHD screens, the display seems plenty sharp for day to day usage. There is no noticeable pixelation when sifting through text-heavy applications or websites. Although the display used on Redmi 4X is a treat to look at, it suffers a lot when it comes to color accuracy. The colors on Redmi 4X have a yellowish tint, which makes the whole display much warmer than it should be. 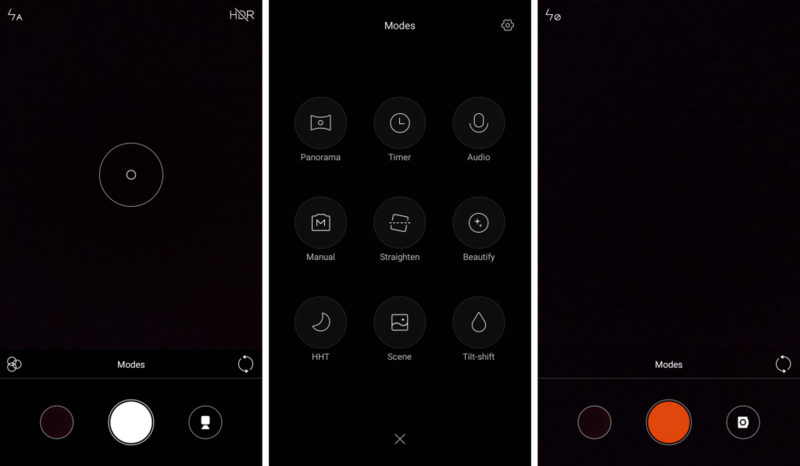 To remedy this issue, Xiaomi has included a temperature option in the display section of settings. 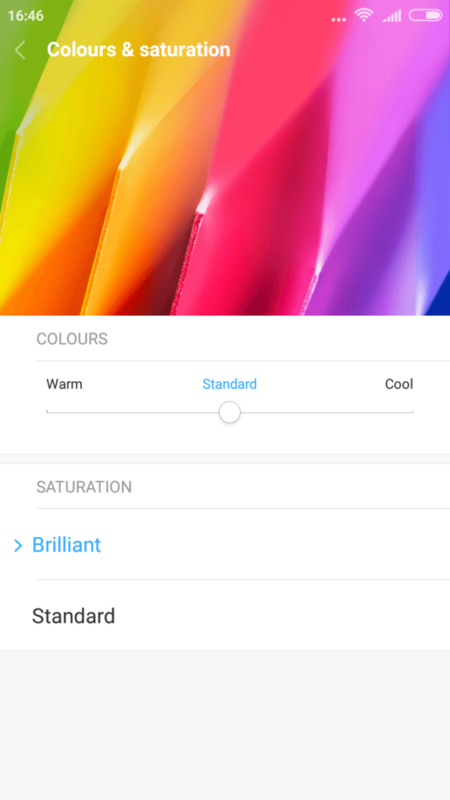 You can use that to adjust the color temperature and saturation of the display. Xiaomi Redmi 4X comes with a Qualcomm Snapdragon 435 processor. It is a 1.4 GHz octa-core processor and it performs reasonably well for the asking price of the device in question. There isn’t any noticeable lag while jumping from one application to another. While on the other hand, its 3GB RAM also makes sure that you can multitask a bunch of other applications in the background. Snapdragon 435 comes with an on board Adreno 505 GPU. 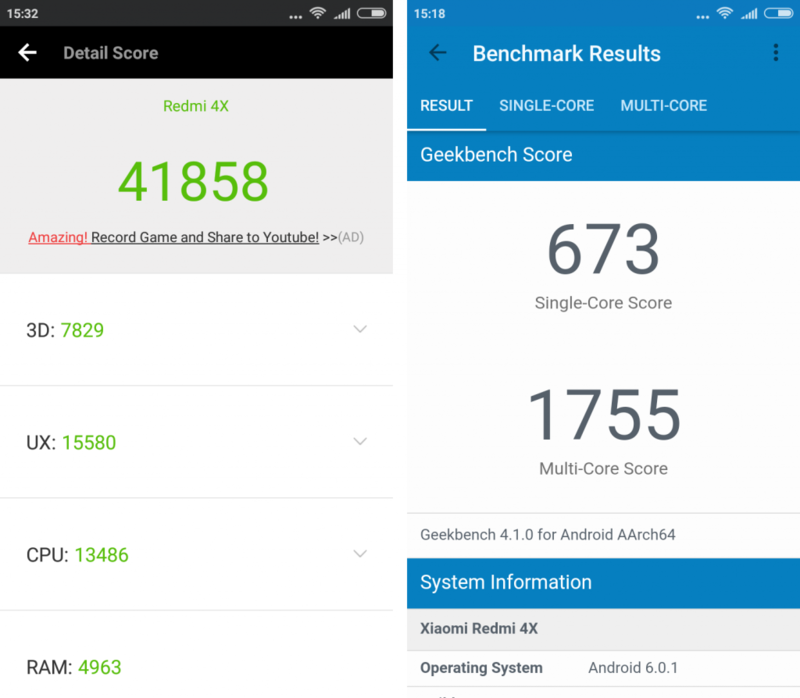 It is not one of the most powerful GPUs out there in the market and the results from AnTuTU and Geekbench depict this fact perfectly. So what do these numbers mean? Well they mean that although the Xiaomi Redmi 4X is not a powerhouse of a smartphone, it will perform perfectly well in normal day to day usage. Its 3GB RAM, along with the 32GB internal storage (which is expandable upto 256GB through microSD card), will allow you to smoothly install and run almost any application from the play store. However, due to its average GPU, you might run into some issues if you try to play some very graphically intensive games. Simpler games like Clash of Clans, Temple Run, Subway Surfers etc. should work without any noticeable problems. Battery life wise, it is probably the best smartphone I have ever used. It can easily last 2 whole days on moderate to heavy usage. Another feature of Xiaomi Redmi 4X, which many people living in electrically challenged areas will appreciate, is its 4,100 mAh battery. A battery this large, in a device with 720p screen and a very power efficient chipset, means that you should get ridiculously good usage out of it. And no, it does not disappoint. Battery life wise, it is probably the best smartphone I have ever used. It can easily last 2 whole days on moderate to heavy usage. Unsurprisingly, the screen on time is also almost always north of 10 hours. 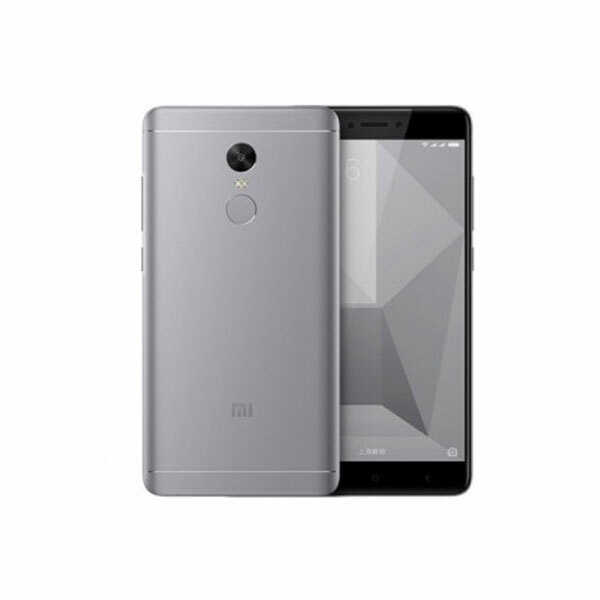 Xiaomi Redmi 4X runs Android 6.0 Marshmallow out of the box, which, to be honest, is a little disappointing. However, there is always hope for an over the air Nougat update in the near future. The interface is heavily customized and is dubbed as MIUI. It follows the Google Material design guidelines and, unlike some other interfaces, doesn’t look out of place in the Android ecosystem. 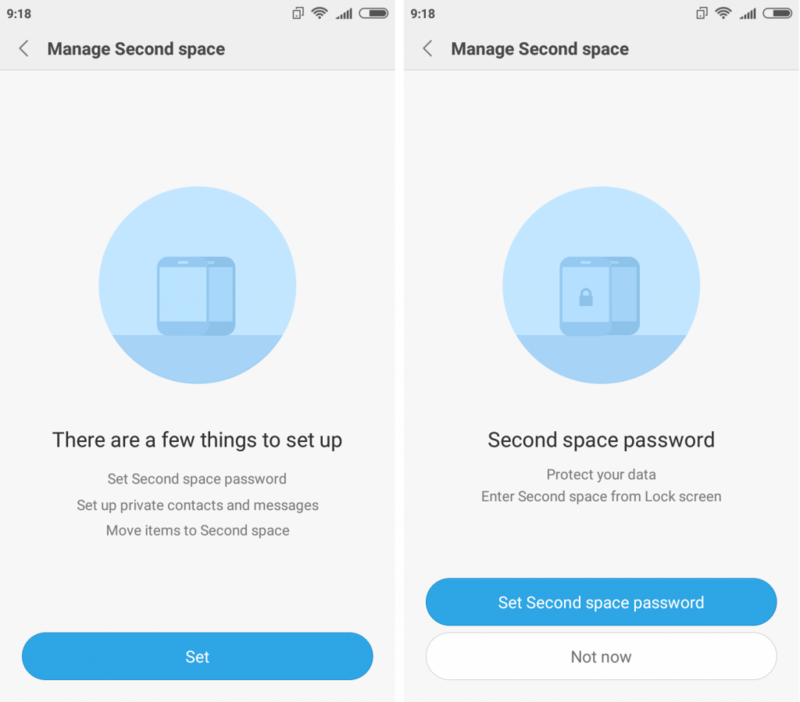 Second Space works in a similar fashion to having different accounts on a PC. You can set up a second space and install completely different applications there. 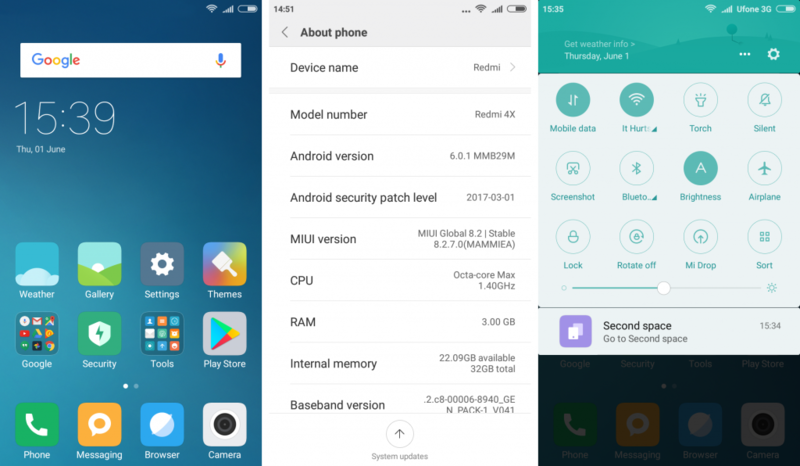 In its 8th iteration, MIUI incorporates some interesting features which make the whole experience much more user friendly. One of the more interesting features is the Second Space. Second Space works in a similar fashion to having different accounts on a PC. You can set up a second space and install completely different applications there. Everything from messages, pictures, accounts etc. will be completely separate across both spaces. You can also set up a password for the second space in settings and use it as a makeshift guest account. In addition to this, MIUI 8 also allows you to clone apps to run multiple accounts of a single service. Through a very nifty feature, aptly named as Dual apps, you can clone any app that supports this feature. Say you have two Facebook accounts that you want to use on your phone. Unfortunately, the Facebook app uses only one account at a time. 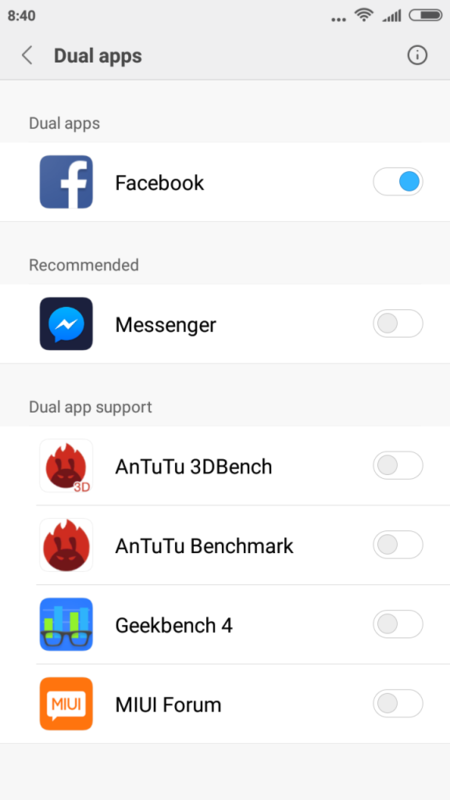 In this scenario, using the Dual app feature of Xiaomi, you can add another Facebook account to your Redmi 4X, this will allow you to use both of these accounts simultaneously. The best thing about the camera is its shutter speed. There is almost no delay between pressing the camera button and the picture being taken. Xiaomi Redmi 4X has a 13 MP primary camera with a f/2.0 aperture. Keeping in view its price, it performs reasonably well as compared to other phones in this price range. Pictures taken by the main camera have good colors, reasonable amount of details and acceptable amount of noise due to post-processing. The best thing about the camera is its shutter speed. There is almost no delay between pressing the camera button and the picture being taken. The front camera is a 5MP camera with a f/2.2 aperture. Although it isn’t loaded with bells and whistles like front facing flash or dual camera, it does take images with above average results. It is perfectly fine for taking casual selfies and wefies. As a bonus, Xiaomi has added some pretty interesting features to the camera. One of them is age and gender detection while using the camera. I’ll admit that it is pretty fun to use, but given that it kept thinking I was a 29 years old female, I have some doubts about its practicality. Coming at a price of about 19,000 Pakistani Rupees, it is a very capable device for those looking to buy on budget. In the start of this review, I stressed upon the point that budget phones are now transforming into quite capable smartphones. From the above discussion, it is apparent that Xiaomi Redmi 4X pays accolade to my original point. Coming at a price of about 18,900 Pakistani Rupees, it is a very capable device for those looking to buy on budget. With Amazing battery life, good camera, sturdy design, and decent performance, it is almost a complete package. It does run almost a year old software but most people probably won’t miss the improvements and features brought along with the newest iteration of Android operating system. With features like Second Space and App cloning, it makes sure that productivity features don’t get cut along with the price.